The upper part of the panel shows two scenes of the risen Christ. On the right is Christ's appearance to Mary Magdalene and on the left the legendary appearance to the Virgin. The setting of the later can be compared to iconography used in representations of the Annunication. The Resurrection is represented in the lower two-thirds of the panel, which is divided by a ledge. The bearded Christ, his head inclined to his right, wears the torse and a loincloth, with the shroud draped over his shoulders. He is shown blessing with his right hand, and holding the cross-staff and banner of the Resurrection in his left. He steps out of the tomb with his right leg, treading on the chest of a soldier who wears a basinet, a tippet of mail, a low-belted jupon, gauntlets and armour. 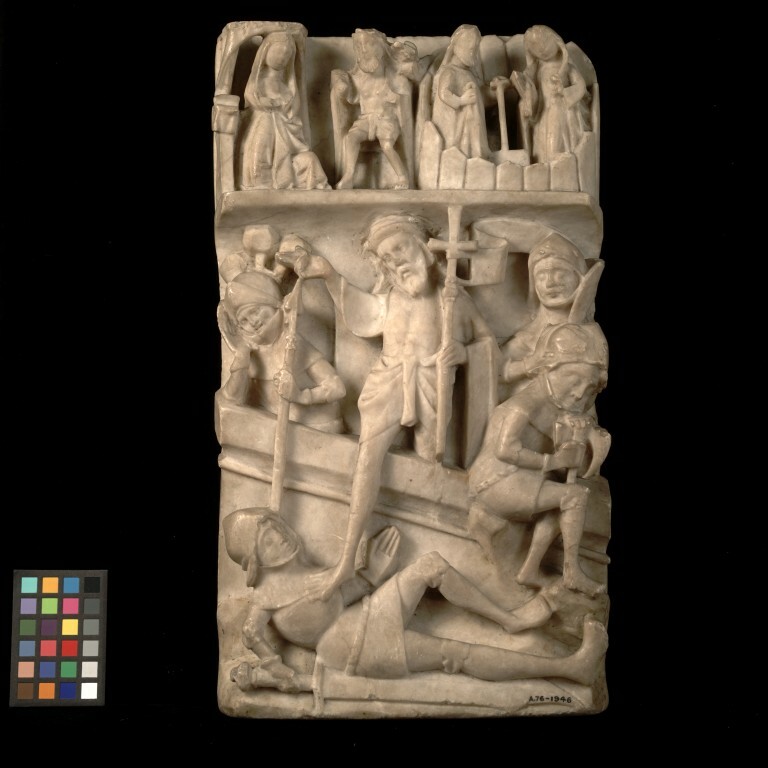 The soldier lies across the front of the panel looking up at Christ, his left hand raised; in his right hand he holds a sword which lies on the ground beside him. A similar sleeping soldier on the right is seated by the tomb on a ledge and leaning on his battle-axe. Two more similar soldiers are represented behind the tomb. The figure on the left rests his head on his right hand, leaning on the tomb; in his left hand he holds a lance which rests on the ground in front of the tomb. The right-hand figure holds a falchion. A heavily stylized tree with polyhedral foliage is represented top left of the scene.The top section of the panel above the ledge contains two scenes of the Risen Christ's appearances. The left-hand scene shows the Risen Christ, bearded and wearing the loincloth, enthroned and turning towards the figure of the Virgin. An unidentifiable object is carved to the right of his head. On the left of the panel, veiled with a cloak, Mary kneels awkwardly under a canopy in front of a desk covered with a cloth on which an open book rests. The right-hand scene shows the bearded figure of the Risen Christ, wearing a gown which he holds up with his right hand. In his left he holds a spade. He stands on the left of the garden which is indicated by the palings which completely enclose him and Mary Magdalene. She is identified by the tresses of long hair which she holds in both hands. No paint remains on the panel. There are eight lead-plugged holes in the back of the panel, four with the remains of latten wires. The bottom has been cut away. Acquired by Dr W. L. Hildburgh in Paris. On loan from him since 1926.Given by Dr Hildburgh in 1946. Historical significance: The panel is most unusual in having three scenes represented on a single panel and unique in the way in which the three scenes relate to each other. 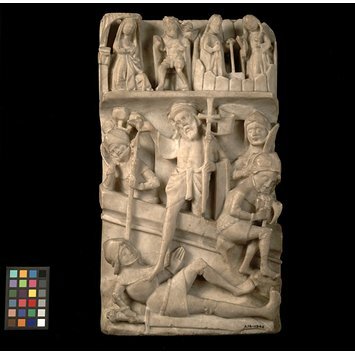 There is no other recorded English alabaster panel showing the Risen Christ's appearance to the Virgin. Alabaster panel depicting the Resurrection with Christ's appearance to the Virgin and to Mary Magdalene. English, late 15th century.